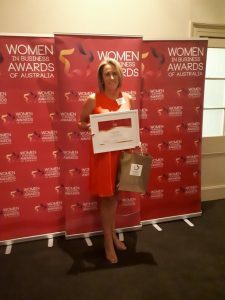 Local business owner and farmer Michelle McVeigh was announced as the 2018 Agribusiness Award winner at the Women in Business Awards of Australia (Downs Region) official gala event in Toowoomba last week. The Women in Business Awards of Australia provides a platform to honour outstanding and successful businesswomen and industry achievers..
As a Partner in one of Australia’s leading regional accounting firms and a Director of a sizeable primary production business, Michelle has carved a career path as a rural business leader and advocate for women. As the only female partner of BMO Accountants in Dalby, Michelle has been recognised as regional pioneer for young female professionals and those balancing motherhood with a career. She encourages and supports employees through training and mentoring, in addition to women across the Western Downs community through public speaking where she shares her honest experiences and views on achieving their own version of a work/life balance. Michelle said she was humbled by the award and recognition of her contribution to the agricultural industry. In partnership with her husband, Michelle also owns and operates ‘Yuruga Agribiz’ a mixed cropping enterprise with farming land near Macalister and various lease properties across the Western Downs. “I openly admit that my achievements would not be possible without my support network. This award is a team effort thanks to my husband and two teenage sons, my parents, my BMO business partners, team and clients at BMO, and family and friends I am extremely fortunate to be surrounded by such an incredible group of honest and caring people”, said Michelle. Michelle said growing up on the land, relying on weather and commodity prices, had taught her to be adaptable and resilient – traits that she had carried through to both her farming and accounting businesses, and helped her to be empathetic to her client’s situations. “I enjoy the challenge of helping clients and their families balance good business decisions with their personal goals. The award acknowledged Michelle’s role in providing farming communities with education and personal support. She was instrumental in the development of BMO’s “The Farmer Wants a Life” roadshow – a seminar and networking event held in remote areas like Dirranbandi, Condamine, Moonie, Cecil Plains and Dalby. “We are always looking at ways to help farmers reach their business and financial goals while navigating all the ups and downs of life on the land. BMO Client and owner of Dalby Engine Rebuilders Cath Celledoni said Michelle was highly respected for the way she conducts herself both professionally and personally with integrity, authenticity, determination, high technical competence and fairness.